Colonel Larrimore leads a program team of more than 150 government and 500 contractor personnel to provide worldwide strategic and tactical forces with weather and space environmental data to support air, ground, naval, and space operations. His $4 billion portfolio includes launch, check out, and sustainment of the Defense Meteorological Satellite Program Block 5 spacecraft, supporting ground systems, and the development of successor terrestrial and space weather programs. Colonel Larrimore is directly responsible for the development, test, acquisition, and sustainment of these system elements to meet Department of Defense operational requirements. Colonel Larrimore entered the Air Force in 1986 through the Air Force Reserve Officer Training Corps at Princeton University. He has served in a variety of space operations, acquisition, command, and staff assignments. He is a Senior Materiel Leader, a member of the Department of Defenses Acquisition Corps, and a fully-qualified Joint Specialty Officer. Colonel Larrimore previously commanded at the Squadron and Group levels, and served as an Air Force National Defense Fellow. Good day, Colonel Larrimore... given your service in the United States Air Force since 1986, how did you determine that you wanted to serve and build a career with this branch of our Nations Armed Services? As many in my generation, I joined the United States Air Force because of the space program. I remember being glued to the television as a young child, watching with awe and excitement as Neil Armstrong took his tenuous steps on the Moon. Ever since that day, I knew I wanted to help advance our knowledge in this mysterious new environment. The Air Force continues to offer fantastic opportunities to meet this ambition while protecting our nation. How did you evolve into the space command division of the U.S.A.F.? What aspect(s) of the space programs attracted you to this arena? Ive been fortunate to be involved in most major aspects of our space enterprise within the Air Force. I started out in space operations which gave me an appreciation of what capabilities our warfighters need each and every day. Later, I worked more traditional engineering projects which pushed the technological state of the art. Now, I am working larger scale system development and acquisition, linking available technology to affordable and resilient space capabilities our operators need and depend upon. Looking back to your formative years in middle and high school, and then at Princeton and Purdue, how important was STEM training to your life goals? Science, technology, engineering and mathematics form the foundation for innovation and advancement in almost all endeavors, and the space enterprise is no exception. A strong STEM background gave me the tools to understand how and why space systems work the way they do, and what we could do to improve on existing capabilities. STEM remains crucial to our nations technological competitive advantage. What can the industry, from the military point of view, do to offer more STEM training to ensure an array of qualified personnel for enlistment into the U.S.A.F. and other branches of our services? I encourage industry, as well as government, to keep offering engagement opportunities to students across the education spectrum. Demonstrations, competitions, and assistance to schools help generate the sparks of curiosity. Our nations science and math teachers need support throughout the community to ensure they have the resources, material, and access to expertise to nurture their students curiosity into new ideas and invention. Would you please explain to us exactly what the Defense Weather Systems Directorate provides that supports our armed services and government programs? The Defense Weather System Directorate acquires and fields our nations space and spaceborne national security weather systems. We develop and launch the Defense Meteorological Satellite Program, a capability our nation has relied upon in various increments for 50 years. We build upon the DMSP foundation by fielding affordable, smaller space weather sensors; incorporating relevant data from our civil and international partners; and leveraging usable data from non-traditional weather sensors. The Directorate works hand-in-hand with our operational customers at the Air Force Weather Agency (AFWA) and the Navys Fleet Numerical Meteorology and Oceanography Center (FNMOC) to ensure the perishable weather data is getting to the right forecaster to support military operations on land, sea, air, and space. What is the Defense Meteorological Satellite Program Block 5 program? How important is this program to our overall national security? The DMSP Block 5 is the current fleet of weather satellites providing critical weather data to our national strategic leaders and deployed forces. Block 5 actually consists of several increments. We are currently flying the 5D-3 satellite increment, with two spacecraft left to launch and operate. 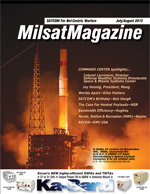 The satellites optical sensors show worldwide cloud data for the Air Force; its microwave sensor tracks typhoons and sea surface winds for the Navy and determines soil moisture for the Army; the satellites space weather sensors help predict GPS weapon accuracy and long distance communication outages. Im pleased to say DMSP will be providing very important support to all Services well into the future. What support services are required for DMSP missions? We operate the DMSP mission (in partnership with the National Oceanic and Atmospheric Administration) with several support services. First we need launch services to get the satellites in orbit. We can launch DMSPs on either Evolved Expendable Launch Vehicle (EELV), the Delta IV or Atlas V.
Once in orbit, we use the Air Force Satellite and Control Network (AFSCN) worldwide antennas for command and telemetry contacts with the spacecraft. We also use dedicated weather ground receive antennas at Fairbanks, Alaska to augment AFSCN. The DMSP system uses a variety of communication services to quickly provide perishable weather data to operational forecasting centers such as AFWA and FNMOC. How is the acquired weather and space data applied to air, ground, naval and space operations? What sort of delay is there in the transmission of such data to the appropriate command center? Do boots on the ground have access to such operational data when in the field and, if not, when would they be able to acquire this information to ensure mission success and casualties prevention? Weather data collected by DMSP is provided to the Services operational forecasting centers. There, a variety of tools and algorithms are applied to generate appropriate weather tools, such as cloud and storm forecasting, typhoon tracking, sea surface wind modeling, and land surface moisture predictions. The DMSP satellites operate in a 101 min polar orbit. That means that we can collect weather data at least every two hours as the satellite passes over the Fairbanks, Alaska ground site. In addition, the Air Force and Navy also operate tactical weather receive stations with their MARK IVB and FMQ-17 systems, respectively. These systems take advantage of DMSPs real-time data broadcast capability. Theater commanders can obtain data almost immediately as DMSP satellites fly over the tactical terminal. With your team, what is the process required to determine the development of current and future programs within your command? We follow the procedures provided in Department of Defense Instruction 5000.02, Defense Acquisition System. This structure ensures the requirements for a new system have been validated, several alternatives are considered to choose the most cost effective system to meet those requirements, and the appropriate amount of oversight is applied to guide the acquisition. The Space Environmental Sensing System plays an important role within the DWS effortscould you explain how such operates and what its goals are in relation to combatant support? Our Space Situational Awareness Environmental Monitoring (SSAEM) program satisfies some space weather requirements demanifested from the National Polar-orbiting Operational Environmental Satellite System from that programs Nunn McCurdy recertification in 2006. The program will deploy three payloads: a Global Positioning System (GPS) Radio Occultation sensor that will provide ionospheric research and space weather forecasting as well as atmospheric vertical temperature and moisture profiles; an Ion Velocity Meter (IVM) that measures the in situ ion velocity vector, ion temperature, and ion composition to better predict the affect of the ionosphere on communications; and a radio frequency beacon that will help predict atmospheric scintillation. This is important for GPS weapon accuracy and satellite communication services to deployed forces by better predicting errors attributed to the space environment. Given your experience with the U.S.A.F., what challenges are ahead for DWSD programs, given current budget restrictions enforced by shortsighted politicians. How will you manage your current and future operations with your hands somewhat tied? And will Space and Missile Systems Center be able to continue to deliver the current high level of support to all troops? If so, how? Any new space system will face challenges never experienced before. The space environment is becoming increasingly congested, contested and competitive as new nations, international organizations, and corporations gain the ability to operate in space. The national fiscal environment forces us to address these challenges with a tight focus on affordability. But in the face of these challenges come opportunities. We have the opportunity today to apply new technologies and methods to create smaller, flexible, and resilient spacecraft to meet our national security needs at a fraction of the cost of past proposals. We also have the opportunity to leverage our civil and international partners investments to ensure we are getting the right weather data to operational forecasters as efficiently and effectively as possible. Looking back over your career, which projects bring a true sense of satisfaction and a smile to your face? At first, one might think about exciting operational accomplishments such as launching the SBIRS GEO-1 satellite or seeing an idea come to fruition such as the GEOlite satellite, but I think Im most gratified when thinking about how teams Ive been associated with have reached out to help others. Its extremely rewarding to see a child in a local elementary school get excited about a subject, become intellectually curious, and yearn to learn. Our Weather Directorate continues this long tradition of community outreach with an active association with local schools.